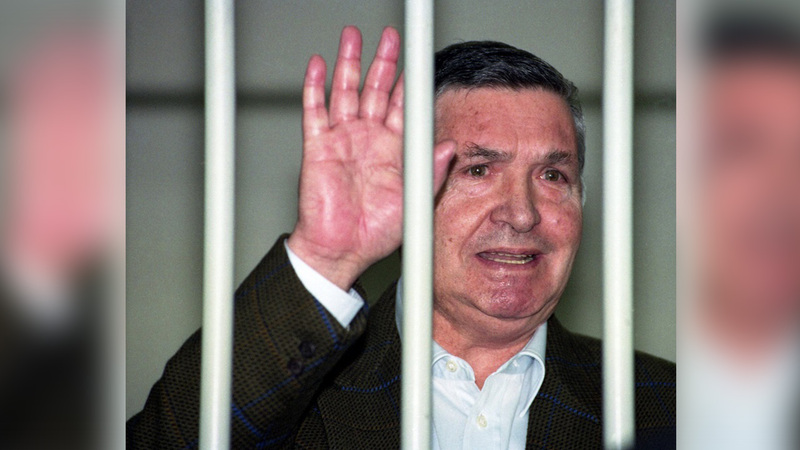 MILAN, Italy -- Mafia 'boss of bosses' Salvatore 'Toto' Riina, who was serving 26 life sentences as the mastermind of a bloody strategy to assassinate both rivals and Italian prosecutors and law enforcement trying to bring down Cosa Nostra, died early Friday. Riina died the day after his 87th birthday and hours after the Justice Ministry had agreed to allow family members at his bedside. He had been in a medically induced coma following two surgeries in recent weeks in the prison wing of a hospital in Parma, northern Italy. The ministry, without elaboration, confirmed his death. Riina, one of Sicily's most notorious Mafia bosses who ruthlessly directed the mob's criminal empire during 23 years in hiding, was serving the life sentences for multiple murder convictions, some dating back to the 1950s. A farmer's son from Corleone, a rocky hill town with notoriety as a Mafia stronghold near Palermo, he carved out a particularly ruthless reputation in a crime syndicate notorious for its evil. Rival bosses were mowed down in the 1970s and early 1980s in Palermo - murders blamed on mobsters happened at the rate of practically one a day in the Sicilian capital in those years - as Riina orchestrated his rise to power. In his campaign for supremacy, he violated many of Cosa Nostra's rules of conduct, including no longer sparing innocent women and children from the spray of hitmen's bullets. He was captured in 1993 in Palermo, where he had an apartment hideout, and imprisoned under a special law that requires strict security for top mobsters, including being detained in isolated sections of prisons with limited time outside of their cells. During the height of his power, prosecutors accused Riina of masterminding a strategy, carried out over several years, to assassinate Italian prosecutors, police officials and others who were going after Cosa Nostra. The bloodbath campaign ultimately backfired, however, and led to his capture. The state, reflecting widespread citizen anger, cracked down hard on the mobsters after bombs killed Italy's two leading anti-Mafia magistrates, Giovanni Falcone and Paolo Borsellino, two months apart in 1992. "He was still considered the 'boss of bosses,' even in prison," Roberti told The AP in a phone interview. "His death will lead to a power struggle at the top of the Cosa Nostra" even if during his decades in a Milan prison cell severe restrictions on his contacts ensured he no longer had any operational influence. As former Palermo anti-Mafia magistrate Alfonso Sabella put it in an interview with Sky TG24 TV: "Up to 3:37 a.m. (the time of Riina's death), he was still the 'capo' of Cosa Nostra." Roberti, who retired this month as national anti-Mafia prosecutor - a position envisioned by Falcone to coordinate all probes of organized crime - said Cosa Nostra had witnessed a degree of marginalization in recent years when compared to the Calabrian-based 'ndrangheta organized crime syndicate that, awash in cocaine trafficking revenue, has spread northward through Italy and across much of Europe. "But as always happens, these periods alternate and there are changes. We are now seeing an increase in activities on a financial level by Cosa Nostra subjects," Roberti added. "We are monitoring this." Salvatore Riina was born in the mountain town of Corleone in central Sicily. Novelist Mario Puzo borrowed the town's name for the main character in the "Godfather" novels, written years before Riina clinched power. The fictional character and his family became the stuff of blockbuster films. Riina married a local woman, 14 years his junior, who was trained as a schoolteacher, Antonina Bagarella, the sister of two alleged Cosa Nostra bosses in Corleone. Investigators believe that Riina jockeyed his way to the top of the Mafia by pitting rivals against each other, and then standing out of the way of the bloodshed that felled one boss after another in the 1970s. Within months of Borsellino's murder, however, anti-Mafia investigators working with turncoats zeroed in on the "capo dei capi," locating Riina and blocking his car on a Palermo thoroughfare on Jan. 15, 1993. "Mute as a tomb" was how RAI state radio summed up his refusal to become a turncoat as ultimately scores of Mafiosi did. Pennisi said he didn't know if the family intended to transfer Riina's body to Corleone. But he said that a public funeral would not be allowed since Riina was a "public sinner."